A new clue to solve the puzzle of DAMA signal! COSINE-100 experiment, an underground dark matter detector at the Yangyang Underground Laboratory (Y2L) in Korea, has the first results that significantly challenge the DAMA claim as a WIMP signal. The astrophysical evidences suggest that the Universe contains a large amount of non-luminous ‘Dark matter’, but no definite signal has been observed despite concerted efforts by many experimental groups. One exception is the long-debated claim by the DAMA group of an annual modulation in the events observed in their detector using sodium-iodide target material as might be expected from weakly interacting massive particle (WIMP) dark matter interactions, and the interpretations made by DAMA have stood for nearly two decades. 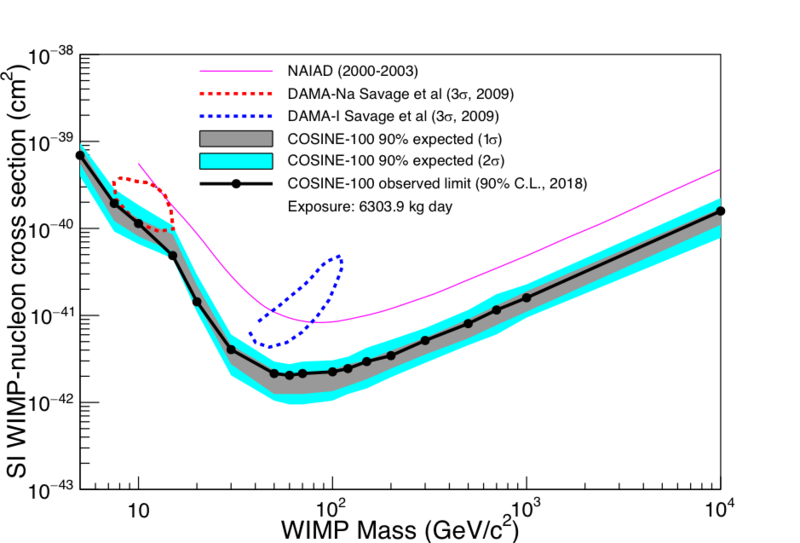 COSINE-100 is investigating the claimed dark matter detection of DAMA using the same target material as DAMA and is the first to release significant results by this means. The collaboration describes results from the first phase of work, a search for the dark matter signal by looking for an excess of events over the expected background. This study indicates that there are no such events present in the data, confirming that DAMA’s annual modulation signal is in severe tension with results from other experiments under the assumption of the most traditional so-called Standard Halo Model for dark matter in our galaxy. Fig. Exclusion limits on the WIMP-nucleon interaction. The observed (filled circles with black solid line) 90% exclusion limits on the WIMP-nucleon interaction are shown with bands for the expected limit assuming the background-only hypothesis. The limits exclude a WIMP interpretation of DAMA/LIBRA-phase 1 of 3 σ allowed region (dot-contours). The limits from NAIAD, the only other sodium iodide based experiment to set a competitive limit, are shown in magenta.